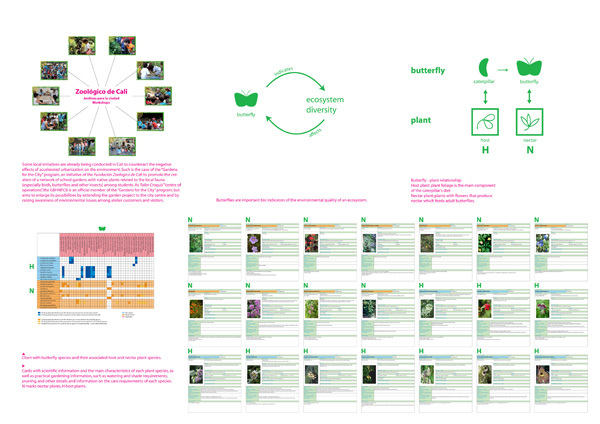 (GBHNPCB) Prototype for a GARDEN BUILDING WITH HOSTS AND NECTAR PLANTS FOR CALI’S BUTTERFLIES – and first actions to promote a social network of environmentally responsible gardener-citizens in Cali. 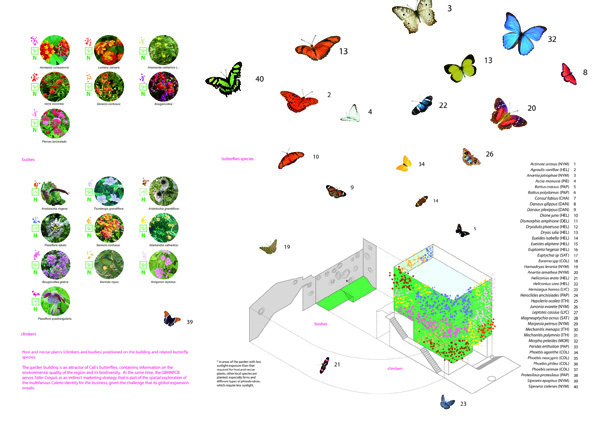 This project, developed in collaboration with architects, clients and environmental organizations, is a prototype for a garden building and a step in creating a network of environmentally-aware gardeners among the population of the city of Cali to take care of the rich local flora and fauna. 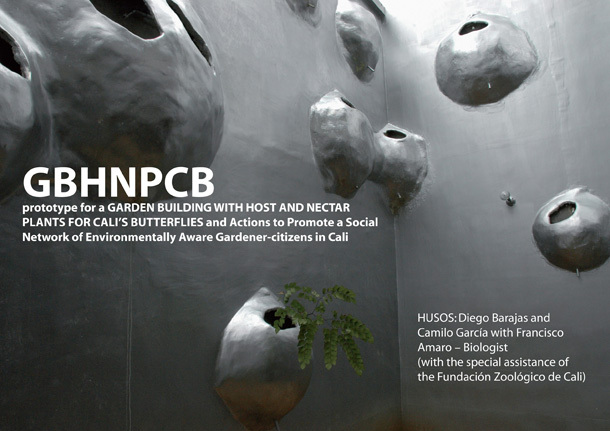 The GBHNPCB (Garden Building for Host and Nectar Plants for Cali’s Butterflies) is a house for butterflies and other insects, birds and people. It also houses living spaces, production spaces and a shop for Taller Croquis, a design atelier whose map of world sales is steadily growing, forming a reduced but economically necessary archipelago of distribution points around the world. By stimulating the presence of butterflies from the region through the use of plants that host and produce nectar to feed them, it works as a “biometer” (an indicator of an ecosystem’s biodiversity). Butterflies are not only one of the most effective bio-indicators, with their presence or absence being a sign of an ecosystem’s environmental quality and biodiversity, they are also particularly important in this region, which contains the largest diversity of butterflies in the world. 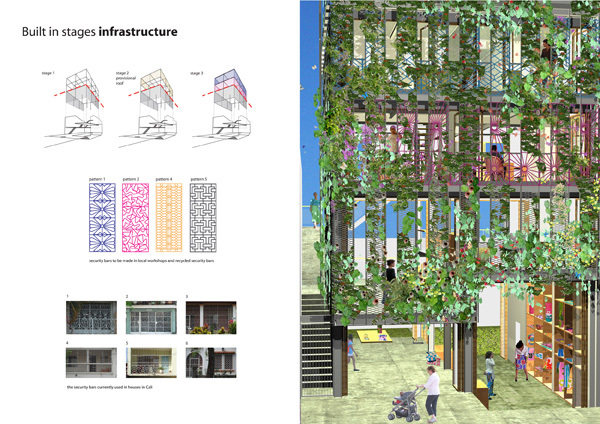 The project benefits the immediate surroundings through its conception as a vertical garden connected to local flora and fauna and also as a structure that provides comfortable conditions for the people living inside, thanks to its porous and open façade, which facilitates natural ventilation. 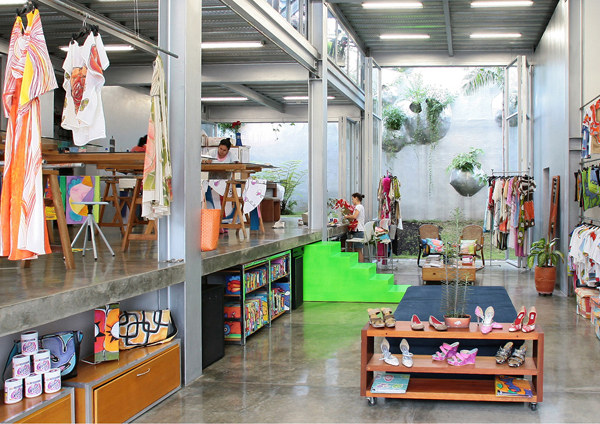 At the same time, by attracting regional butterfly varieties, the building serves Taller Croquis as an indirect marketing strategy in facing the challenges of global business expansion, and strengthening the already-existing links between the brand and the city, becoming a means for the atelier to spatially explore its multifaceted Caleño identity. The shop’s everyday activities and the network of women who sell Taller Croquis’ products act as agents to spread information about environmentally-responsible gardening practices in relation to Cali’s flora and fauna. 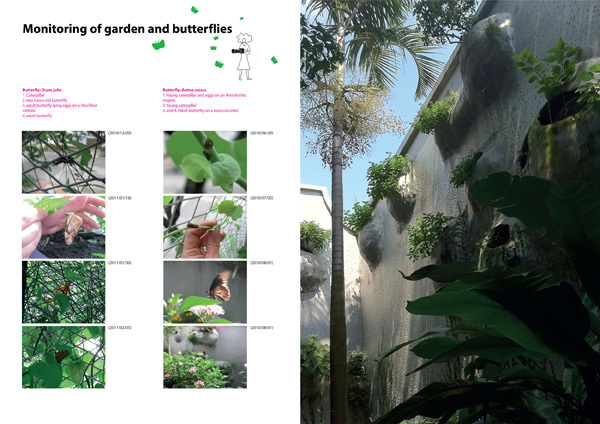 By taking care of the garden for the benefit of the butterflies and other insects, the atelier workers are developing stronger bonds with each other and with their customers and, more importantly, helping to promote a greater affection and respect among Caleños (the people from Cali) for the highly diverse forms of natural life present in the city today. The shop’s working and exhibition space is conceived as a sort of domestic-collective space, similar to the front gardens of traditional neighbourhoods, typical spaces of Cali where the boundaries between private and public life are blurred. This approach is designed to give the shop a very open and visible space, while preserving the domestic character and atmosphere of the original business. People in Cali are often more enthusiastic about going shopping than going to a natural history museum. 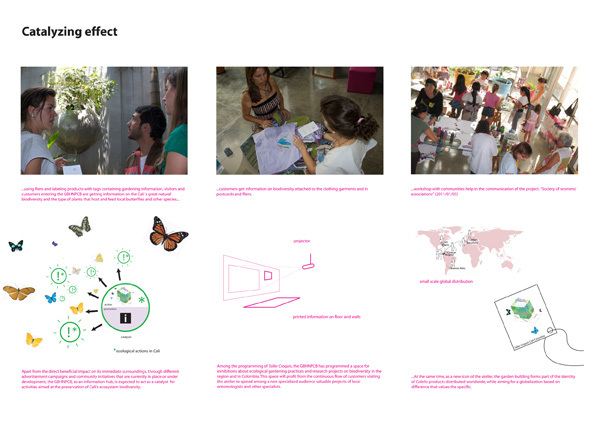 So we thought about how an apparently banal experience like shopping could be made more interesting because of its ability, as a part of everyday life, to affect people’s imaginaries and stimulate certain behaviours. We thought that developing new commercial practices at the shop could therefore have the potential to create awareness among the atelier’s clients about certain environment-related common welfare issues in Cali. The project comprises two complementary components: One is the GBHNPCB, the physical infrastructure, designed to be built in stages (adapted to suit the shop’s financial capacity). 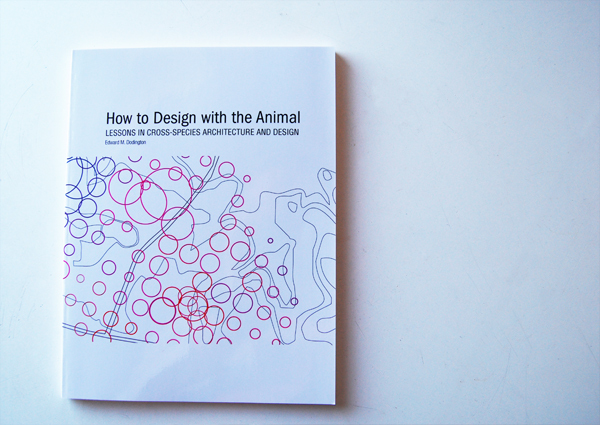 The other is Proyecto Cali, an independent, non-profit entity, created by the architects and biologist Francisco Amaro, along with the Taller Croquis, and with the enthusiastic collaboration of the local zoo and other specialists. The original and immediate goal of this entity was, and continues to be, the development and maintenance of the garden façade, but its main objective is to act as a long-term interdisciplinary entity helping to promote research and action-awareness strategies on the importance of protecting the great natural biodiversity that still exists in the area. In the context of a weak state/public presence and limited resources and willingness on the part of local governments to carry out large-scale, long-term actions or plans, we believe it is necessary to develop projects based on responsible self-management and action, with micro actions and spatial strategies designed to transcend the limited scope of most of the private initiatives currently involved in the development of cities such as Cali. 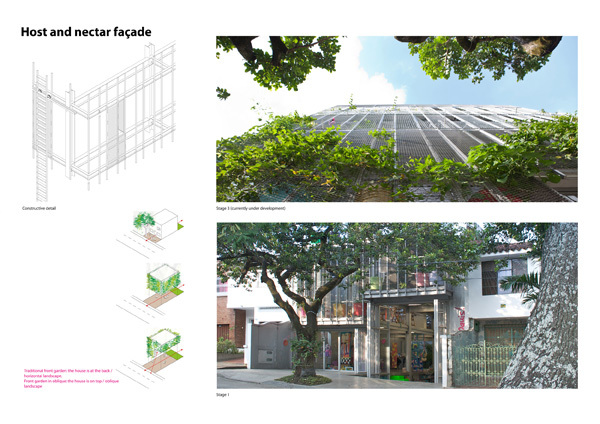 The garden building, meanwhile, serves as a new icon for the atelier, providing an identity for Caleño products distributed worldwide within a new model of globalization based on differentiation and recognising the worth of local values. 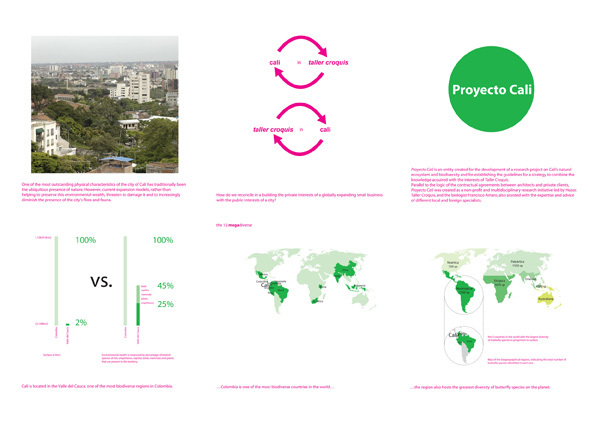 The GBHNPCB aims both to create a new image for Taller Croquis and to uncover a new Cali, at once more urban and more tropical. Photography: Javier García, Manuel Salinas. Acknowledgments: Fundación Zoológico de Cali, Douglas Laing (Agronomical Engineer specialist in tropical agriculture), Lorena Ramírez (Biologist. Universidad del Valle. Colombia), Luis M. Constantino (Biologist Entomologist, Ms.C, Associate Researcher National Centre for Investigations in Coffe. Cenicafé. Chinchiná), Ricardo A. Claro (Biologist Entomologist. Universidad Nacional de Colombia. Colombia), José Martín Cano (Biologist Entomologist. Universidad Autónoma de Madrid), María García, Manuel Salinas y Julián Velásquez.